No 1 Roofing & Building Supplies carries all of your guttering supplies, and are Sydney’s leading supplier of gutters and guttering accessories for builders, roofers, owner builders and the general public. 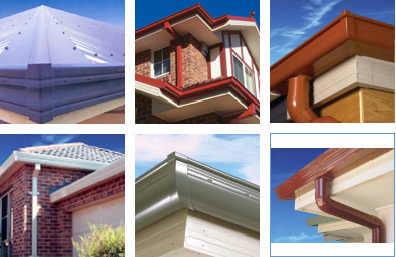 We are Sydney's ACE, Lysaght, Stramit, ABC Seamless, Stalco, Stratco and Metroll supply specialists and carry a wide range of gutter profiles on display at prices that you just won’t find anywhere else in Sydney. All our rainwater products are of the highest quality, strong and durable, exactly what you need to deal with the torrential summer storms and harsh Sydney winter conditions. At No 1 Roofing, we have built our reputation on carrying one of the most comprehensive range of guttering supplies in Sydney and we won’t be beaten for range, price or service. As well as carrying a full range of pre-fabricated guttering systems in our Sydney warehouses, we can also provide custom made guttering solutions for any building in almost any material. No1 Roofing and Building supplies is a leading supplier of all ACE Gutter products and are able to supply an extensive range of ACE Gutters rainwater products such as the Quad, Nu-Line, Square-Line, Half Round Gutter, and the Old Style Quad Gutter. The ACE Gutters products are manufactured in Australia, and are backed by a 20 year warranty, and are available in an extensive range of rainwater products to suit all of your guttering needs. The QUAD Gutter by ACE Gutters is a high front quadrant gutter is a very popular guttering that is used on both new home and colonial style homes. It has a 115mm diameter and is available in with slotted overflow holes. The flow rate volume for the QUAD Gutter is 1.5 litres per second over 1m in length. Also has 6.2 litres measured to overflow holes. ​Colours include Hunter Red, White, Federation Green, Brown, Heritage Red, Smooth Cream, Merino, Jasmin Brown, Slate Grey, Iron Grey. ​Heritage Red, Smooth Cream, Merino, Jasmin Brown, Slate Grey, Iron Grey, Mountain Blue, Dusk, Off White, Birch, Gull Grey, Armour Grey, Mist Green, Caulfield Green, Monolith, Ebony, Rivergum, Territory, Coventry, Gulf, Manteal, Basal, Wallaroo. 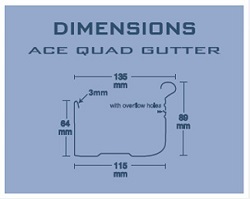 The Old Style QUAD Gutter by ACE Gutters has a lower front face than the ACE Quad gutter and no overflow holes. 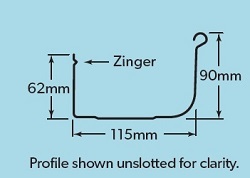 It has a 115mm diameter and is not available with slotted overflow holes. ​All Ace Colours. (NSW & ACT only), Hunter Red, White, Federation Green, Brown, Heritage Red, Smooth Cream, Merino, Jasmin Brown, Slate Grey, Iron Grey. Mountain Blue, Dusk, Off White, Birch, Gull Grey, Armour Grey, Mist Green, Caulfield Green, Monolith, Ebony. The Nu-Line Gutter by ACE Gutters is also known as Fascia gutter and is a gutter and fascia in one. It's been designed for installation directly to roof rafters without the use of timber fascia. 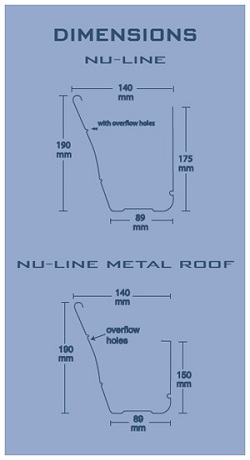 The flow rate volume for the NU-LINE Gutter is 5 litres per second over 1m in length. Also has 12.6 litres measured to overflow holes. 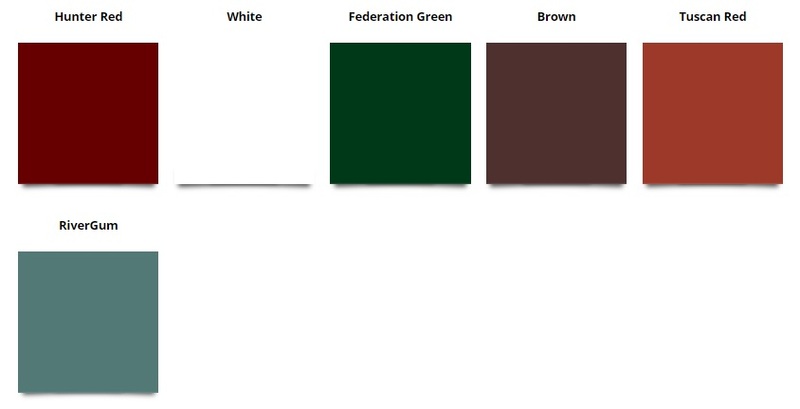 ​Colours include White, Brown, Heritage Red, Smooth Cream, Slate Grey, Iron Grey. The Mini-Line Gutter by ACE Gutters is known as the smaller version of the Nu-Line gutter due to the similar front profile. 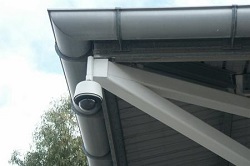 It has a flat back and fits flush to the fascia by use of the concealed brackets. With a 20% rainwater capacity over the 115mm Quad gutter it is makes it perfect for heavy rainfall areas. 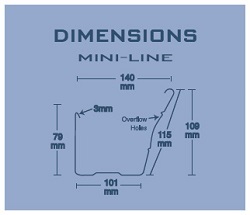 The flow rate volume for the MINI-LINE Gutter is 2.5 litres per second over 1m in length. Also has 7.3 litres measured to overflow holes. ​Colours include White, Brown, Heritage Red, Smooth Cream, Merino, Jasmin Brown, Slate Grey, Iron Grey. ​Colours include Ebony, Rivergum, Monolith. 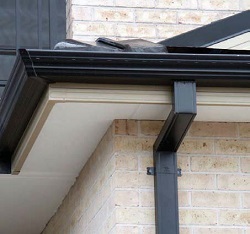 The Square-Line Gutter by ACE Gutters is a square front gutter. It's a slotted gutter that will need to be folded around corners which eliminates the use of external angles. It is fixed with concealed brackets and is ideal for carports, garages and pergolas with the slotted overflow holes in the front. 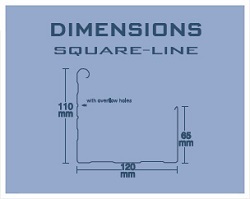 The flow rate volume for the SQUARE-LINE Gutter is 1.5 litres per second over 1m in length. Also has 6.4 litres measured to overflow holes. 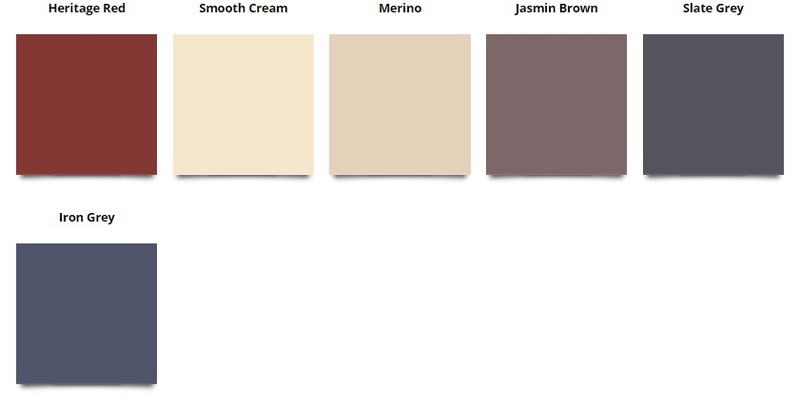 Colours include White, Brown, Heritage Red, Smooth Cream, Merino, Jasmin Brown, Slate Grey, Iron Grey. ​Colours include Dusk, Off White, Birch, Gull Grey, Armour Grey, Mist Green, Caulfield Green, Monolith, Ebony, Mountain Blue, Rivergum, Territory, Coventry, Gulf, Manteal, Basal, Wallaroo. The Half Round Gutter by ACE Gutters is a square front gutter. It's a slotted gutter that will need to be folded around corners which eliminates the use of external angles. The flow rate volume for the Half Round Gutter is 1.5 litres per second over 1m in length. Also has 6.4 litres measured to overflow holes. 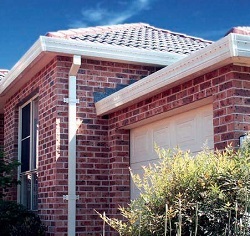 The Round-Line Gutter by ACE Gutters is a cylindrical designed gutter. It's a european style gutter with a flat back and no external brackets with a 150mm diameter with a self cleaning feature. The flow rate volume for the ROUNDLINE Gutter is 1.5 litres per second over 1m and 2.5 litres per second over 1m without overflow holes. Also has 6.32 litres measured to overflow holes or 7 litres measured to back of gutter. Colours include Heritage Red, Smooth Cream, Merino, Jasmin Brown, Slate Grey, Iron Grey. ​Colours include Heritage Red, Smooth Cream, Merino, Jasmin Brown, Slate Grey, Iron Grey, Mountain Blue, Dusk, Off White, Birch, Gull Grey, Armour Grey, Mist Green, Caulfield Green, Monolith, Ebony, Territory, Coventry, Gulf, Manteal, Basal, Wallaroo. ACE Round-Line Gutter is also available in a Plain - Slotted or Unslotted - Custom Cut only. No1 Roofing and Building supplies is a leading supplier of the LYSAGHT Gutter products and are able to supply an extensive range of LYSAGHT Gutters rainwater products such as the Quad, Sheerline, Trimline, Half Round Gutter, and the Flatback Gutter. 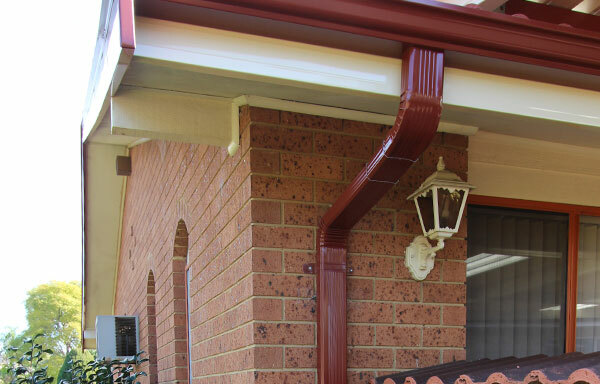 The LYSAGHT® Gutters are manufactured from COLORBOND® and ZINCALUME® steel. 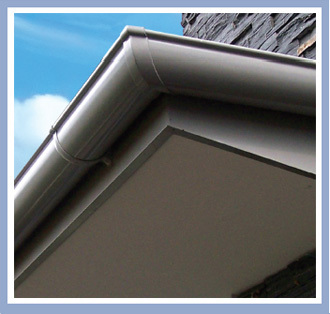 LYSAGHT Guttering products come in a range of profiles to suit any style or application. The QUAD Gutter by Lysaght is a classic guttering design that is ideal for replacing an existing gutter or for installation to a new home. It's compatible with both steel and tile roofs and is an ideal choice for any home. QUAD Hi-front Gutter has a high front design that helps to obscure the roofline for a more attractive finish, and is compatible with the NOVALINE Fascia system for quick easy attachment to the building. QUAD Hi-front Gutter is available in Slotted or Unslotted, and QUAD Lo-front Gutter is available only in the Unslotted profile. 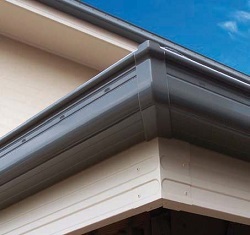 QUAD Gutter is available in unpainted ZINCALUME® steel and in a range of standard Colorbond steel pre-painted colours to match or contrast your roof. 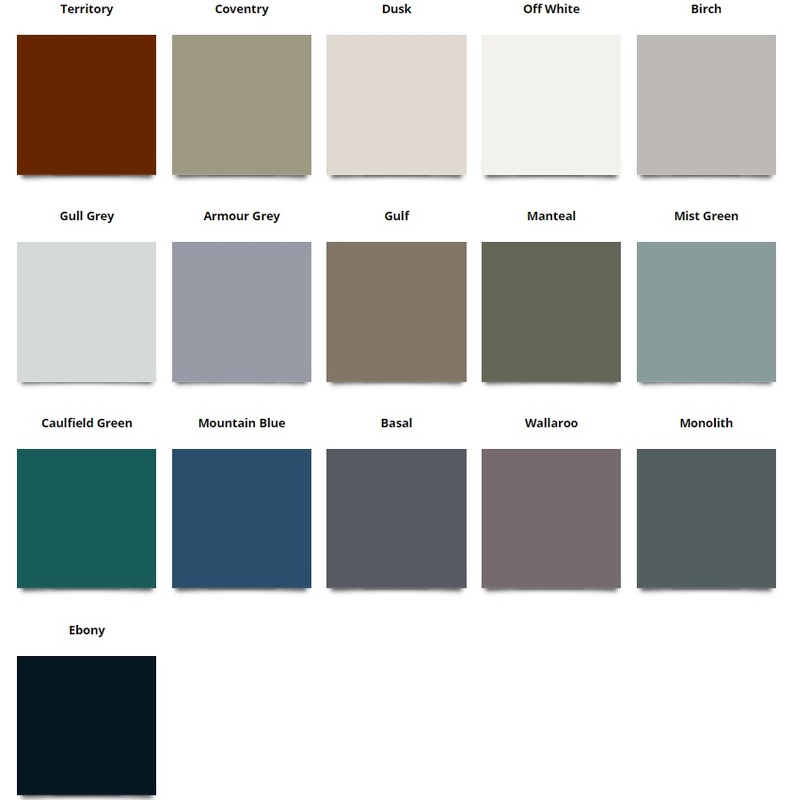 ​Colours include Basalt®, Classic Cream™, Cottage Green®, Cove™, Deep Ocean®, Dune®, Evening Haze®, Gully™, Ironstone®, Jasper®, Mangrove®, Manor Red®, Monument®, Night Sky®, Pale Eucalypt®, Paperbark®, Shale Grey™, Surfmist®, Terrain®, Wallaby®, Windspray®, and Woodland Grey®. Please check with your local No1 Roofing consultant regarding specific colour availability for this product. 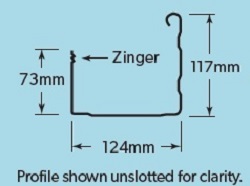 Is available to suit a range of accessories such as internal, external brackets, stop ends, overstraps and internal, external corners. The SHEERLINE Gutter by Lysaght is a slim, elegant square gutter that is particularly suited to domestic applications, it is an extremely flexible fascia and guttering system that features a concealed fixing that offers a clean and seamless finish. The SHEERLINE Gutter is fast and easy to install, has greater durability, longer life and is compatible with steel and tile roofs. 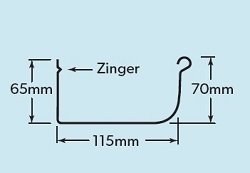 SHEERLINE Gutter is available in Slotted or Unslotted profile. Is available in unpainted ZINCALUME® steel and in a range of standard Colorbond steel pre-painted colours to match or contrast your roof. 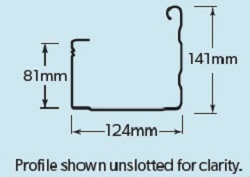 Is available to suit a range of accessories such as internal, external brackets, and external end stops. The TRIMLINE Gutter by Lysaght is a strong, economical fascia gutter that is particularly suited to new homes or to match existing gutter installations. It is extremely popular as a replacement gutter as it is quick and easy to install. 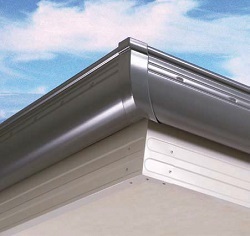 The TrimLINE gutter is compatible with the NOVALINE Fascia system, and has a concealed fixing for a clean and seamless finish, and is suitable for steel or tile roofs. 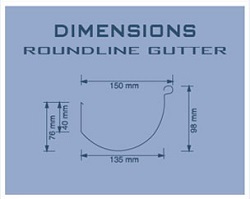 TRIMLINE Gutter is available in Slotted or Unslotted profile. The HALF ROUND Gutter by Lysaght is a modern gutter system with a high rainfall carrying capacity. 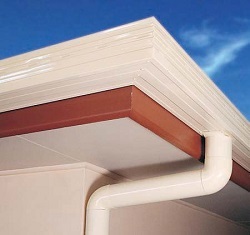 Is an improved self-cleaning gutter due to it's curved base for minimal build-up of water and dirt. The HALF ROUND gutter has a range of easy fix guttering accessories and is only available with external brackets. 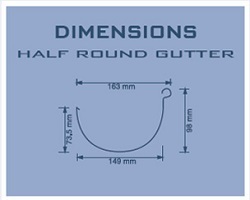 HALF ROUND Gutter is available in Slotted or Unslotted profile. The FLAT BACK Gutter by Lysaght is a contempary styled gutter system with a high improved self-cleaning gutter due to it's curved base for minimal build-up of water and dirt. The FLAT BACK gutter has a range of easy fix guttering accessories and is only available with internal brackets. FLAT BACK Gutter is available in Slotted or Unslotted profile. 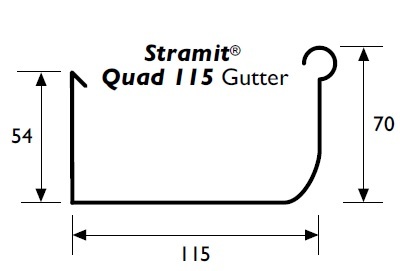 No1 Roofing and Building supplies is a leading supplier of the STRAMIT Gutter products and are able to supply an extensive range of STRAMIT Gutters rainwater products such as the Quad, Triline, M Pattern, S Pattern, Half Round Gutter, and as well as the Flatback Gutter. 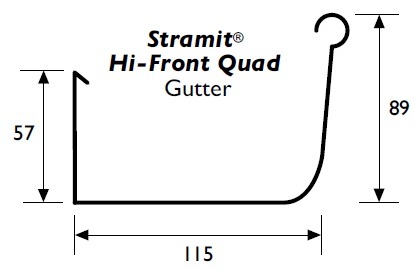 The STRAMIT® Gutters are manufactured from COLORBOND® and G550 and G300 Zinc Aluminium coated steel. STRAMIT Guttering products come in a range of profiles to suit any style or application. 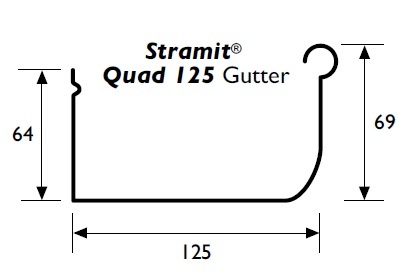 The 125, 115, & HI-FRONT QUAD Gutter by Stramit is a traditional styled gutter system are suited for modest size applications, the Hi-Front Quad is a popular style that has more drainage capacity. 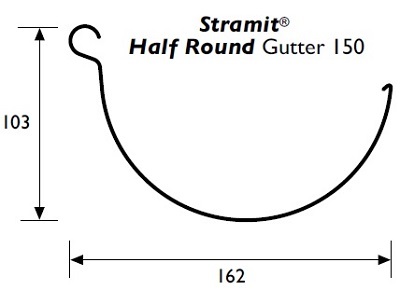 The STRAMIT rollformed gutter products are designed for installation on residential and light commercial applications, and come with a wide range of matching accessories. 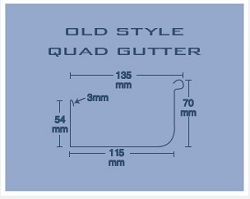 HI-FRONT Quad Gutter is available in Slotted or Unslotted profile. 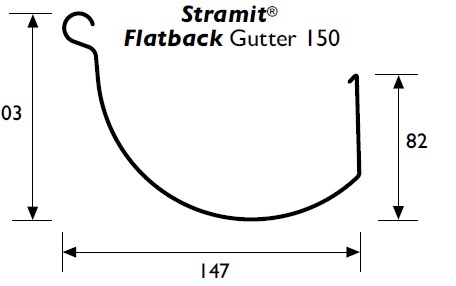 The FLATBACK Gutter by Stramit offers a smooth, clean appearance that is free from external support brackets, plus the curved shape of the gutters helps for self-cleaning. 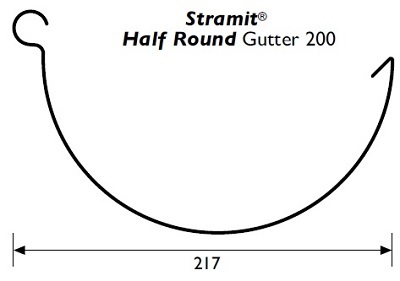 The HALF ROUND 150 & 200 Gutter by Stramit offers the same classic lines of the half round gutter and is suitable for any home design. HALF-ROUND Gutter profiles provide a huge water carrying capacity and can also be supplied with overflow slotes. 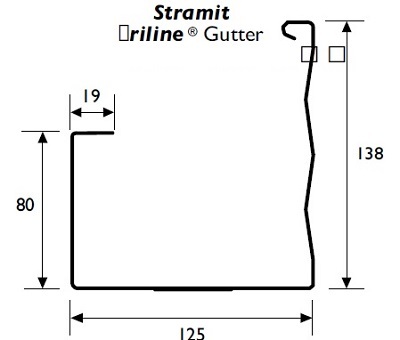 The Triline Gutter by Stramit is a contemporay profile that has been designed for good looks with excellent water-carrying capacity. 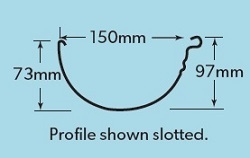 Triline Gutter is available in Slotted or Unslotted profile, also available in hook back or stiffened back versions. 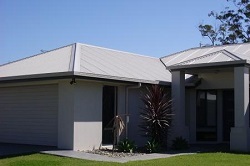 Is available in a range of standard Colorbond steel pre-painted colours to match or contrast your roof. Hi-Gloss finishes in Triline stiffened back version only. No1 Roofing and Building supplies the ABC SEAMLESS Gutter products and are able to supply an extensive range of ABC SEAMLESS Gutter products such as the Sheerline, Miniline, Old Style Quad, High Front Quad and Fascis, as well as the Ogee Gutter. 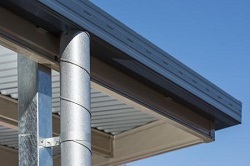 The ABC SEAMLESS Gutters are Made from the heaviest 0.7mm aluminium gauge material and have a high gloss two coat silicone modified polyester finish, endures the harshest Australian climate. ABC Seamless have the largest range of Guttering Profiles to suite any style of roof for residential or commercial applications. The ABC SEAMLESS OGEE Gutter provides an essential “high back - low front” profile which ensures overflow away from your house. This avoids the concern of quad and other low back gutter styles with overflow into the eave and wall cavity. The ABC SEAMLESS Gutter are a quality product and offer the following advantages. NOTE: These are approximate colours, and for accuracy, we recommend checking the chosen colour against an actual sample of the product before purchasing. ABC Seamless have an extensive range of Aluminium Gutter Colours to suite any style of roof for residential or commercial applications.